Receive intruder alerts anywhere in the world. 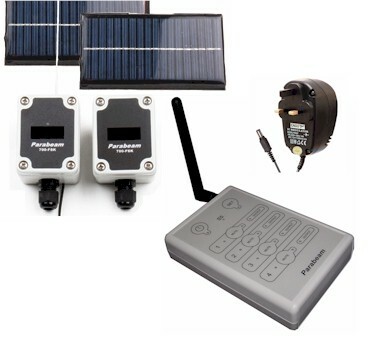 Ideal for remote security for homes, holiday homes, farms, businesses, stables, orchards, nurseries etc. Know when to view your internet CCTV cameras. 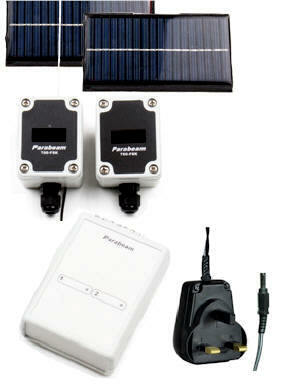 Plugs directly into Parabeam 600-S or Parabeam 700-fsk 4 base receiver with no additional power source required. 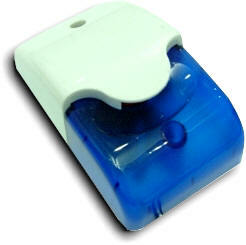 Program phone numbers and alert names to your specification before despatch. Can auto dial up to 8 telephone numbers to receiver alert text messages. Activate relay output via text message to operate lights etc. 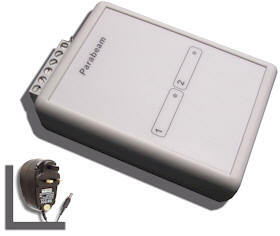 IN STOCK A must have add-on to any Parabeam Driveway Alarm / Perimeter Alarm system. 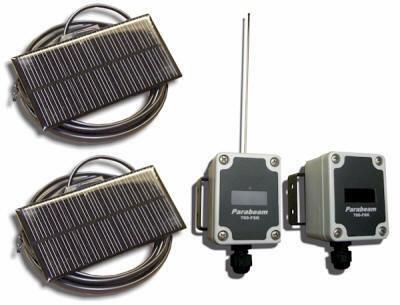 Receive alerts either direct from the security beam transmitter or from the relay transmitter supplied powered by the 2 or 6 zone long range base receiver. Still receive alerts while you're out in the paddock, garden or out-buildings. 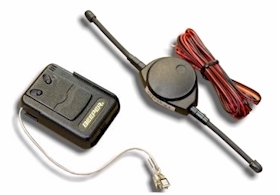 When alerted, Parabeam's base receiver powers the relay transmitter and gives 100 meters range (open air) to the pocket pager. Features include: Choice of 10 pre-programmed tunes & tones, belt clip, cord aerial with security clip, L.E.D. flasher, silent mode (just flasher), batteries included. 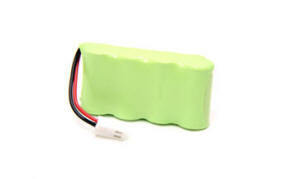 IN STOCK The Pocket Receiver Mains Adapter adds extra flexibility. As well as a battery powered pocket receiver you can take anywhere (up to 100 meters), the mains adapter allows it to left switched on indefinitely without draining the batteries. 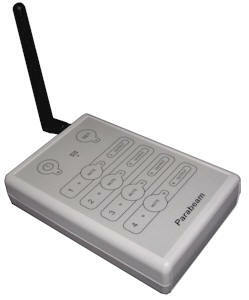 Also, add a second, static low cost receiver for other rooms or locations. 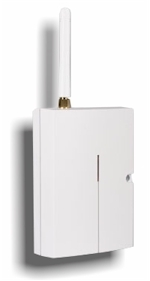 Easily add this weatherproof external / internal alarm siren to the Parabeam system. At 116 dBA it's very loud and can be powered directly from the Base Receiver's timed output. Ideal as a deterrent when an intruder has been detected. Would also give and extra audible alarm for neighbours or security staff. 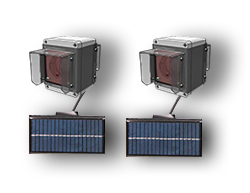 Easily add this weatherproof external / internal security strobe to the Parabeam driveway / perimeter system. 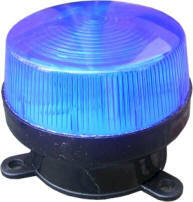 A blue flashing light is always and excellent intruder deterrent. It can be powered directly from the Base Receiver's timed output. Add multiple security strobes for different locations. 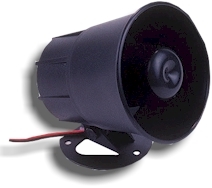 Easily add this weatherproof external / internal security strobe / Siren to the Parabeam driveway alarm / perimeter alert system. A blue flashing light is always and excellent intruder deterrent whilst the siren gives and audible warning of detection..
Output duration from 20 seconds to 120 seconds. Fixing: 2 x 6mm dia. Supplied with approx 0.5m red and black cable.